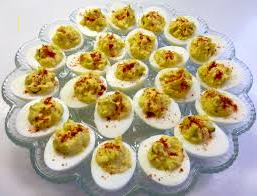 If you are an egg lover and are not allergic, then Deviled Eggs are a treat most people cannot resist. This recipe is a basic recipe that is great for small gatherings as well as a tasty additional appetizer. We prepare these for every special occasion and find our family and friends love to prepare them too. One of our friends will make them with olives and garnish with paprika. In the recipe she uses a bit of white vinegar and with the olives you get a tang sensation. Our recipe is very basic but you can add more of the ingredients if you desire or add a bit of horse radish to it for the hot bite. The choices you have are almost endless. Deviled Eggs - Louises Style! Hard boil eggs in boiling water. Take from stove and set aside to cool. Peel shells from eggs taking care not to break the whites. Cut eggs in half length wise and remove the yolk from the egg halves placing in a medium size bowl. Arrange egg white halves on a platter or serving dish. With a fork, mash the egg yolks to a fine crumble. Add salt, pepper, mustard and mayonnaise to taste. Blend well until mixture is smooth in texture. Fill the hollowed out egg whites with the yolk mixture and sprinkle a small amount of paprika over the tops. Great for small parties. Flavor is enhanced when served at room temperature. If your eggs don't come out of their shells properly and you're left with a bit of an egg mess, you can always make egg salad and use it for a sandwich or in our egg dip recipe. First, skip the spicy brown mustard and go with a Dijon mustard using the same quantity. Second, add horse raddish paste to the spicy brown mustard. Now, we're talking... This is an add to taste amount, so you might want to do some taste testing before you serve to your family and friends. Eggs not peeling easily? Try this trick, place egg in a large glass tumbler and add a small amount of water. Cover the open end of the tumbler and shake the egg in the water so the shell breaks apart and the water can make its way inside the shell. Once the shell has water surrounding the egg, the shell will peel easily. We love having Meatballs as a side dish. Return to Easy Everyday Cooking Recipes from Deviled-Eggs.